This Sapadilla Concentrated All Purpose Cleaner tackles all sorts of jobs around your home. Powered by naturally-derived sugars and other plant-based ingredients (no irritating SLS in here), this eco-overachiever will do wonders on any hard surface. Use it on floors (including wood), walls, bathroom fixtures and even your car—no job is too big or too dirty. Ingredients: Purified Water, Coco Glucoside, Cocamidopropyl Betaine, Sodium Citrate, Lactic Acid, Ethyl Alcohol, Essential Oils of Peppermint, Rosemary, Clove and Sweet Orange, Xanthan Gum, Potassium Sorbate, Sodium Benzoate. Love this. Nice light fresh smell. Love it on my countertops and stove. Like that it is a natural product. (I will be trying that :) Great product. This is my "go to" cleaner. I make a light solution with about 1 TSP to 500 MLS and use it to clean EVERYTHING! A little goes along way. I love this stuff so much. Great, great cleaner. Excellent product. The smell is amazing and only a little quantity is needed. I have been washing floors, kitchen benches and bathrooms with this soap for years now. Please donâ€™t stop making it! Love this! It smells amazing and a little bit in a spray bottle goes a really long way. This is even better than windex for cleaning windows and does a great job for general, all purpose cleaning. This product makes you think you're in a spa of essential oils not scrubbing grime! It is fantastic, and it is Canadian! Can't get better than this. This. is. the. best. cleaner. Smells amazing, works amazingly. You are supposed to dilute 1-2 Tbsp. in 4 L of water which means one bottle will last you forever. 5 stars, will def. be repurchasing. I use this product for cleaning floors, countertops, bathroom surfaces etc. It works well and smells fantastic. 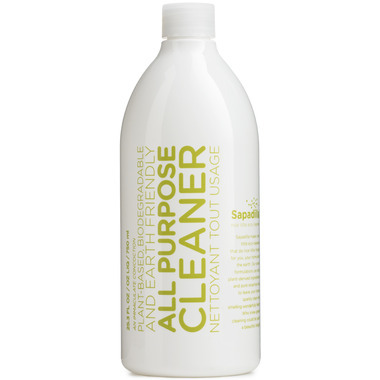 It is my go to for a more natural cleaning product! This will clean anything! I can use this cleaner everywhere in my house and I'm happy to know it is safe, Canadian, and works! The scent is so fresh and unique. One of the best parts is that you only use 1 to 2 tablespoons diluted in 4 litres of water so this bottle will last a long time. It also doesn't irritate my sensitive skin, so no need for gloves! great cleaner and great smelling. I have got more then one friend hooked on these products! Great smell, Canadian made, works well. I really like using this product to clean the shower and for the floors. You can really use it to clean anything. Gentle formula but tough cleaner. This product works well and the rosemary and peppermint leave a refreshing scent. I love this cleaner, the rosemary peppermint is a great combination that leaves my house smelling fresh without being overpowering. This is a great multipurpose cleaner! Just received my second bottle from well.ca. Love how it smells, I am on a mint kick right now. Also love that it's non-toxic and natural. Makes me excited to clean! Sapadilla please make more products! Excellent product! Bought it after reading the reviews on here and it works great. Use it diluted in a spray bottle to clean counter tops etc and great for mopping the floors too! Smells fantastic! This concentrated cleaner has become my favourite product this year. I use it in the kitchen, office and bathroom and it makes cleaning fun. I have the lavender, grapefruit & peppermint but this is my favourite scent. Awesome product. I use it diluted in a spray bottle for counters etc. It seems expensive but goes a long way when diluted. Great scent. I also use it diluted in my spray mop. Love the fresh and clean smell. It's a typical natural cleanser (they all seem to work the same). The value for the money is amazing as it's a super concentrated formula so a little goes a long way! I really enjoy this scent as well as this line of cleaners. Very satisfied. I love that this is Canadian, smells wonderful, is non toxic and CLEANS MY FLOORS and every other surface in my house! Great product and would recommend to others. I am very surprised this works as well as it does. Simply, its fantastic. Product actually does a top job of cleaning sealed wood parquet floors and leaves a far better shine than almost all other products I've ever used. Same for my ceramic tile kitchen floor. And of course the smell makes cleaning a more pleasant chore to do. Canadian made, works excellent, no chemicals cleans amazing. A little pricey, however, a little goes a long way. Worth buying. My bathroom never looked so clean and smelled so fresh. Better than any other product I have ever used. Wish it was cheaper though.